In high school and college I always looked forward to summer because that was the time when I would finally have a chance to read whatever I wanted. Of course, I was a nerd and some of those choices would include reading things like The Iliad and The Odyssey, twice, completely voluntarily, but still. It was my time to read whatever I chose. Each year, however, I inevitably fail at reading all the books on my summer reading list. Usually because I’ve added too many books to the list and it’s just not possible to read them all. Sometimes it’s because I’ve gotten distracted by new releases and other titles that aren’t on my list. Occasionally it’s because now that I can read whatever I want throughout the year, summer becomes a down time from reading; it’s the time to be outside, hang out with friends, go on vacation, etc. and reading isn’t as high on the to do list as it might normally be. Once in a while it’s because I’ve decided to be pretentious about my summer reading list and add books like Great Expectations, The Aeneid, and Anna Karenina (someday I’ll finish those last 200 pages, I swear). 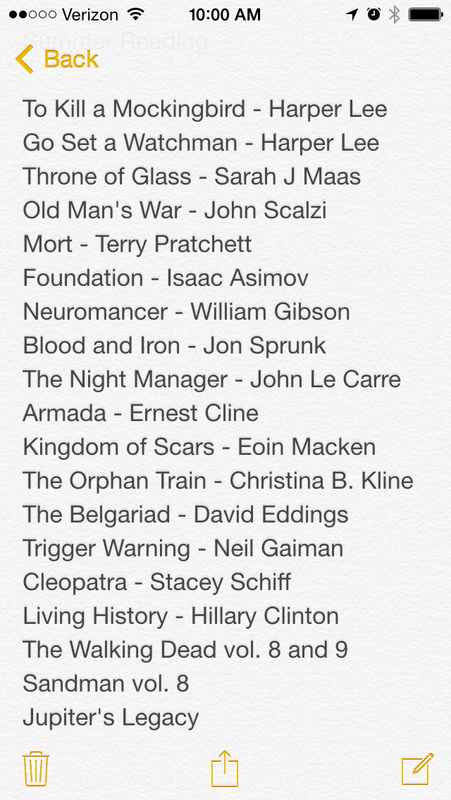 However, each year I still start off the summer with my list of books to read, and each year I endeavor to cross off as many as I can. What you see in the picture above doesn’t even encompass my entire summer reading list, as I’ve added one or two books to it, plus there are several books on my list that haven’t even been published yet. Ernest Cline’s second novel, Armada will be released in July on the same day as the eagerly anticipated Go Set a Watchman by Harper Lee. I also really want to read Stephen King’s Finders Keepers, which just came out yesterday, but first I need to read Mr. Mercedes and that’s a slippery slope. 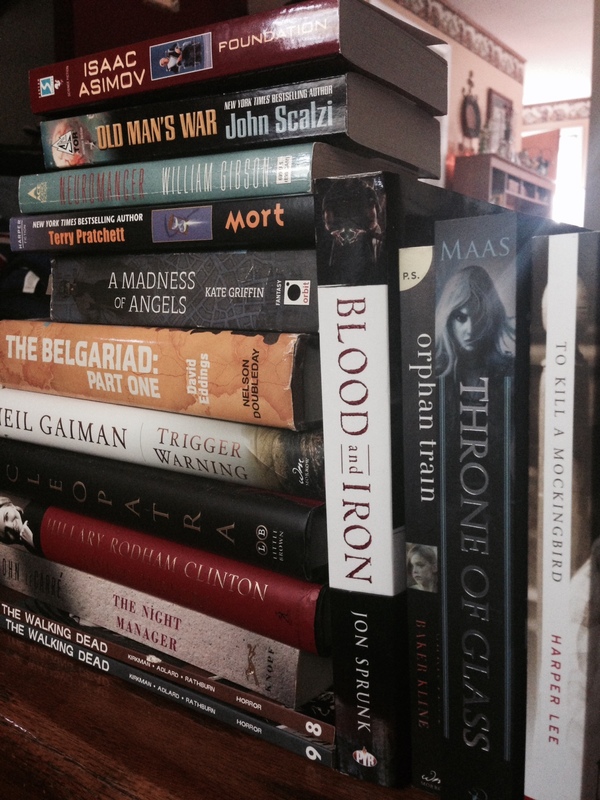 One book leads to another leads to another … this is why my to read pile never gets shorter. As you can see on the left, my summer reading list for this year is rather varied. To Kill a Mockingbird has been on my reading list since the sequel was announced, but I haven’t taken time to read it yet. I know To Kill a Mockingbird is a favorite for a lot of people, but I wasn’t a fan when I was forced to read it in high school. I suspect my opinion may be different now, which is one of the reasons I’ve been wanting to read it. Also because I’m looking forward to Go Set a Watchman. Along with those, a friend recommended I try The Belgariad series so another friend lent me her copy which includes the first three novels of the series. I promised to give it a try, and since I’d like to return the book within a reasonable amount of time I put it onto my summer reading list. A third individual has been trying to get me to read the Throne of Glass books for months, so I finally picked up the first one and intend to start it soon. Blood and Iron is the first book in a new series by Jon Sprunk and is the July book for my book club (he’ll also be at that meeting to talk about and sign the second book, Storm and Steel, so I want to make sure I’ve read the first). I’ve enjoyed some of his other writing, so I look forward to this one. Mort, which I am currently reading, is on the list as part of my attempt to finally read through Terry Pratchett’s Discworld series. I’m sure it will take some time to get through all 40-some novels, but I’ve enjoyed what I’ve read so far. You can see A Madness of Angels in the photo at the top, but not on the list because I’ve already crossed that one off. (Yay, progess!) You can read my thoughts on the book in this post from earlier this week. The fact that Neil Gaiman’s Trigger Warning is still on the list and hasn’t been read yet makes me sad. I really need to get on that. I was so excited about this book coming out, but just haven’t had time to get it read yet. Cleopatra and Living History are on there as an attempt to add some diversity to my reading. I don’t read a lot of non-fiction, but I try once in a while. I decided that there needed to be at least a little represented on this reading list. I’ve been meaning to read Cleopatra since it was first published, but never got around to it. Living History is my attempt to learn a little more about Hillary Clinton before we get fully into election season. The Night Manager and Orphan Train may be seemingly the most random books on the list. The Night Manager has also been on my list for a while, ever since the series starring Hugh Laurie and Tom Hiddleston was first announced. I’ve never read any of John Le Carre’s books, so I have no idea what to expect. Orphan Train is just one that I’ve seen around the bookstore a lot and was curious about. Kingdom of Scars by Eoin Macken may not be a familiar title to many, partly because it can currently only be purchased in the U.S. as an e-book, but I’ve been wanting to read it ever since it was published in the UK. Finally, I have to have some graphic novels on this list. I have been very slowly catching up on The Walking Dead, but never seem to actually get there (I’ve been “slowly” reading them ever since the series premiered). I would like to at least get ahead of the show before it comes back, but I think they’re still several volumes ahead of me. I’ve also been taking forever to read through the Sandman graphic novels. Not because I don’t love them (I do) but they are an expensive investment and I like to buy the graphic novels I’m reading. (It’s a quirk of mine.) Now that I have a bookstore discount again hopefully I’ll be able to pick up the pace a little. I only have a few of the original Sandman volumes left. Jupiter’s Legacy is one that has been featured as a “Buyer’s Pick” at our store for weeks now, and every time I’m in there I pick it up and look at it. I finally bought a copy the other day because I’m curious. So there’s my summer reading plan as it stands right now. I guarantee books will be added, and some I probably won’t get to as others become more interesting to me. I already have a few in the back of my mind that I’m probably going to plan to read as well before the summer is out. There’s just so many books to read, and not enough hours in the day to read them. What are you planning to read this summer? Share your lists in the comments! Maybe I’ll have to add some of them to mine. It’s an eclectic mix! Nice 🙂 For me I’m currently reading Murakami’s 1Q84 and I plan to read Equus, The turn of the screw, All the light we cannot see, Harvest, We are all completely beside ourselves, The great gatsby and The goldfinch. I really want to read 1Q84, but Murakami is never a light read. I’ll get to it someday soon, I hope, because I really love his writing. Same with The Goldfinch – the size is intimidating, but I’d like to give it a chance. The Great Gatsby is another one that, like To Kill a Mockingbird, I think I would appreciate much more now than I did in high school. I hope to have a chance to read that again soon (100 Years of Solitude is also on that Second Chance list). Yeah, 1Q84’s really quite interesting. Murakami’s ambiguous style is never dull. I’m interested to know what your favourite play and novel is? Ah, the inevitable “what’s your favorite book?” question. Not an easy one to answer, and I’m honestly not sure I have one. Favorite play is a little easier, as I haven’t read many, but I really love August Osage County (the movie wasn’t bad, but the original play is brilliant). Books are much, much harder. Among my favorites are: Stardust, On the Road, The Hobbit, The Hitchhiker’s Guide to the Galaxy, The Time Traveler’s Wife … and the list could go on.